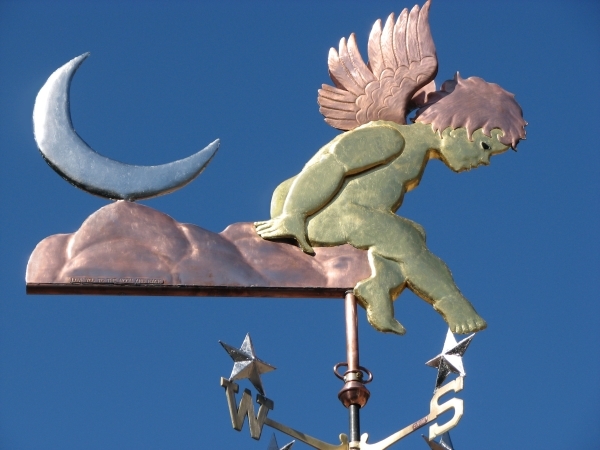 A sweet and popular weathervane, our Cherub with Moon, Stars and Clouds looks lovely both silhouetted against the sky or in a garden setting. 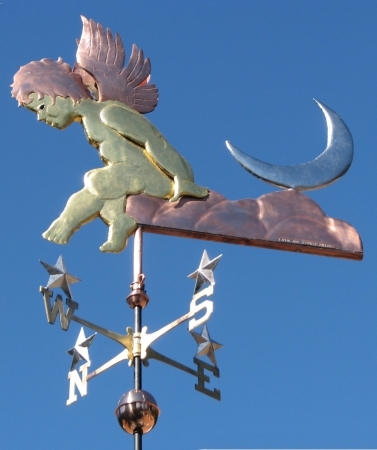 Our customers have selected this weather vane as a gift to new parents, as part of an angel collection, and as a memorial to a loved one; with the cherub gently watching over the faceted stars on the directionals below. 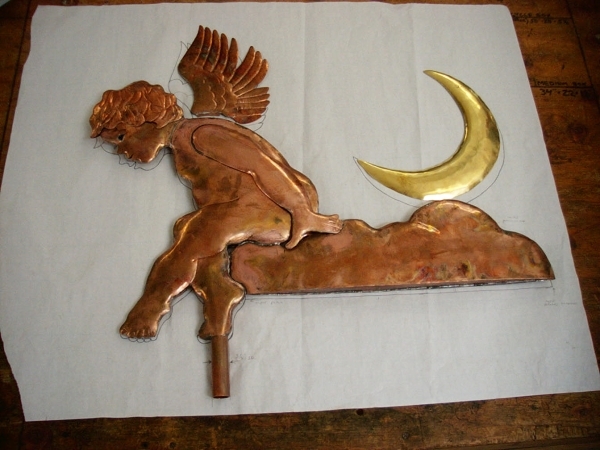 As shown here, the sculpture piece was made in copper with optional gold leaf on the cherub. We made the moon using optional nickle silver and added optional palladium leaf to the faceted stars. 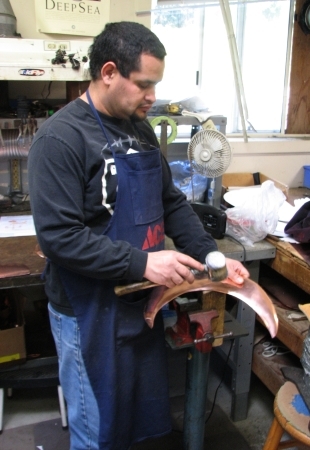 For those who prefer a more subtle variation in colors, we can make this weathervane using a combination of copper and brass. The price for the copper and brass version is the same as the all copper version listed here. 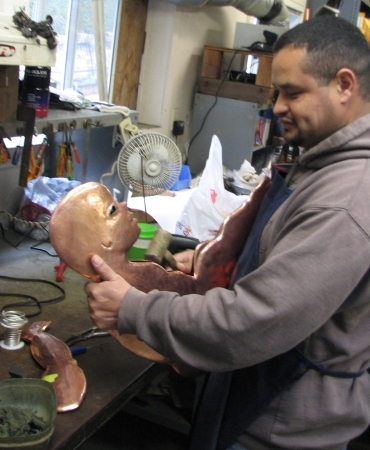 Customers can choose from a nice range of colored translucent glass eyes for their cherub. When the light is just right, you can see sunlight dancing in the cherub’s eyes. We can also add “lucky” pennies. 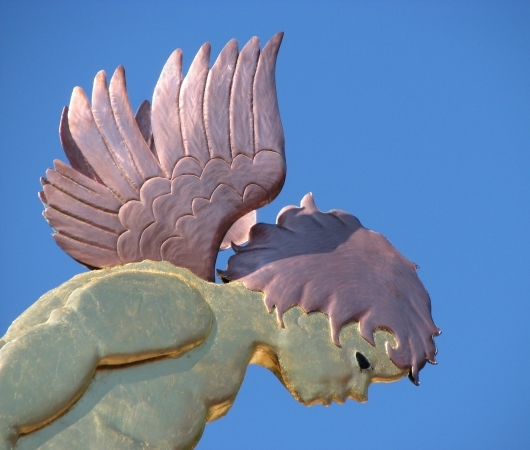 In cases where the cherub is acting as a guardian angel, we have put special pennies from the years of each family member’s birth inside the faceted stars perched atop the solid brass directionals. One of our customers was kind enough to send us photos of their cherub in it’s garden setting. 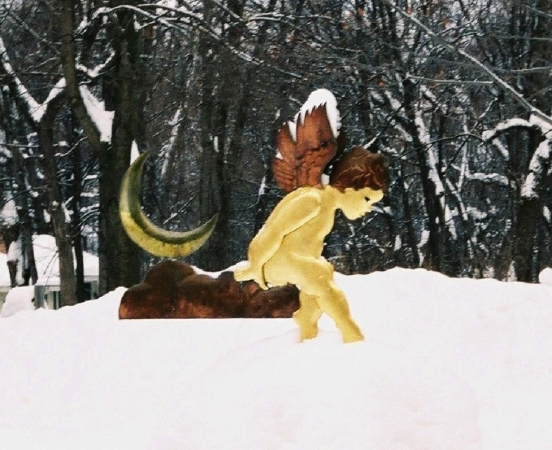 As you can see, even in the quiet aftermath of a snow storm, the cherub looks beautiful.